When Toys “R” Us arrived in Sweden in 1995 armed with a translation of its U.S. employee handbook, it underestimated the Swedes’ fierce commitment to the quality of their working lives. The solidarity among Swedish workers was powerful enough to accomplish a feat that may seem inconceivable in Canadian retail; they brought the global conglomerate to its knees. The company refused to sign a standardized collective agreement, the heart of employee-employer relations for more than 25,000 companies across all sectors of the Swedish economy. The decision affected only 150 employees, but it resulted in a three-month long strike by the retail-store employees union that snowballed into an all-out boycott. In the Scandinavian country, 70 per cent of workers are unionized — though that figure has fallen from its peak of 86 per cent in 1995. Average starting pay is as much as 40 per cent higher than it is in Canada. Employees take a minimum of five weeks of paid holidays, receive overtime pay for working weekends and holidays and are entitled to generous parental leaves of up to 16 months. Sweden also happens to have one of the lowest levels of income inequality in the Western world. When Toys “R” Us refused to back down, transport workers stopped deliveries to the stores, warehouse workers wouldn’t handle shipments bound for their stores and bank employees refused to process transactions for the company. They stopped Toys “R” Us from advertising in the local press, and Swedish blue- and white-collar workers’ unions encouraged their 2.5 million members not to shop there. Word spread, and the strikers’ actions drew support from workers across Europe and the world. An international federation of unions asked its members in 70 countries to boycott the toy retailer. Short of packing its toys and leaving the country, the billion-dollar corporation had no choice but to acquiesce and agree to terms that are standard in Swedish collective agreements. Toys “R” Us was both an exception to the rule —even McDonald's was forced to sign a collective agreement — and a warning for other corporations that they must adapt to the Swedish model or fail, Thomas Andersson, associate professor in management at the University of Skovde said in a phone interview from the city southwest of Stockholm. “The Swedish example illustrates that it doesn’t need to be a Bleak House where you’re treated bad,” he said. The power of Sweden’s workers stands in stark contrast to the reality of the nearly two million retail employees in Canada. The retail sector is Canada’s biggest employer of both men and women – comprising 11.5 per cent of the workforce – but pays the lowest average hourly wage of any occupation, at $14.15 an hour. Retail and food service jobs have the highest rates of low wage work. Minimum-wage jobs paying $10 to $11 an hour are common. The average weekly wage for retail workers is $540, or $28,000 a year. Six out of ten retail workers, more than a million Canadians, earn less than $15 an hour, the amount activists consider to be a “living wage” — the minimum income necessary to escape poverty and pay for basic needs. The North American retail sector is characterized by job insecurity, short and split shifts, unpredictability of working hours, low-wage part-time work, and the need to juggle multiple jobs to earn a living wage. In the past six months, retailers as big as Target and Sony as well as smaller Canadian chains such as Smart Set and Jacob have announced shutdowns, putting more than 20,000 Canadians out of work. Among all sectors in the Canadian economy, the sales and services sector has the second highest number of people on employment insurance, behind only trades and transport. With few exceptions, retailers in the highly competitive North American market have adopted a “lean and mean” strategy in which they pay employees as little as possible to keep labour costs down and raise profit margins. Earlier this year, Quebec’s labour board determined that employers are not required to modify employees’ hours so that parents can work on a schedule that allows them to balance family and work obligations better. The first Walmart store to form a union in Canada was shut down within months of unionization in 2005. Sweden’s own Ikea locked out 350 unionized employees at a store in British Columbia — one of just two unionized Ikea's in Canada — for 17 months before settling, having driven labour negotiations to a level of acrimony unlikely in Sweden and highlighting the challenges when a small group of local workers faces off against a multinational corporation. The treatment of retail workers should matter to all Canadians because it affects the entire economy, said Kendra Coulter, a labour studies professor at Brock University in St. Catharines, Ont. Improving jobs in that sector will mean more upward mobility into the middle class, the mainstay of consumption and domestic demand, she added. The sector has taken on greater significance because other major employers have shrunk in recent years. The low-paying retail sector replaced the unionized manufacturing industry as the biggest employer of Canadians for the first time in 2007, and its importance has only increased in the aftermath of the Great Recession. There are now more Canadians selling things than making them. “Because sectors like retail are playing this increasingly central role in our economy, if we don’t improve the conditions in these kind of sectors, this country is going to look very different in 20 years,” Coulter said. Although retail employs a similar percentage of the workforce in both Canada and Sweden, Coulter said, workers in the Nordic country have more influence on their wages and working conditions for one major reason: unions. Just 12 per cent of retail workers are unionized in Canada, compared with 60 per cent in Sweden. In the Nordic country, retail work is considered a "good job" and employment is referred to not as “work” but as “working life” to emphasize “that paid work is one part of people’s broader existences and that workers are real people with families with bodies that get sick, with goals and aspirations and rights to their own time and to a decent quality of life,” Coulter said. The Nordic model of labour relations developed in the early 20th century, when business owners and union heads determined to work together on mutually beneficial agreements that avoided strikes and work disruption. Employers have found that delegating larger responsibility to workers is beneficial to their happiness and therefore their productivity at work. Most Swedish employers have never tried to fight trade unions, while unions concentrate their efforts on giving employees better employment conditions and steer clear of infringing in employers’ decision-making processes, said Birgitta Nystrom, Sweden’s national chair in labour law and a professor at Lund University, near Malmo. In Canada and the United States, governments have had to mandate the lowest amount employees can be paid, but the Scandinavian country has no minimum wage. It doesn’t need to, because wages are negotiated by unions and employers’ associations, and, unlike in North America, there are no sectors in Sweden that fall into the definition of low-wage work, where earnings are below two-thirds of the national gross median hourly earnings. Labour legislation is virtually non-existent. Instead, collective agreements shape employer-employee relations, Nystrom said. About 90 per cent of workplaces in Sweden are covered by collective agreements, even those that are not unionized. 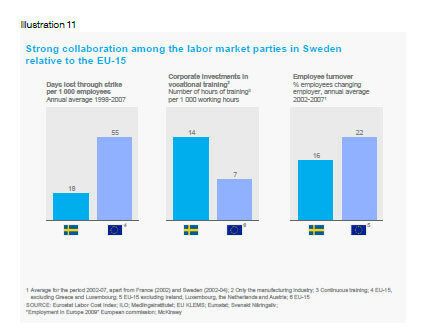 Generally, Swedish employers are just as interested in having collective agreements as employees, because they like the certainty of negotiations and systems that are stable and universal, Nystrom said. “They like to know that these are the rules that apply and that during the lifetime of the collective agreement they will not be the object of strikes or something like that,” she said. Karl Gustafsson owns a retail lumber yard with 85 employees in Sodra Sandby, in southern Sweden. When he was eating at a Florida restaurant in February while on vacation, he was surprised to find one person to greet and seat him, another to take his order and a third to serve it. “In Sweden, this would had been one and the same person,” he said, adding that that is in part because each employee costs more than in the United States. After several years of paying out bonuses with very little reaction from employees, Gustafsson decided to take all of his employees on a trip that significantly boosted morale, even though it cost less than the bonuses he usually paid out. Retail work in Sweden is more co-operative and collaborative, and the distinctions between employees and managers less apparent than in the rest of the world. That is partly responsible for higher levels of job satisfaction reported in a study conducted by professor Thomas Andersson and colleagues. The study found retail workers were highly satisfied with their tasks, managers and colleagues, as well as highly committed to the success of the stores and relatively satisfied with pay, training efforts and opportunities for advancement. 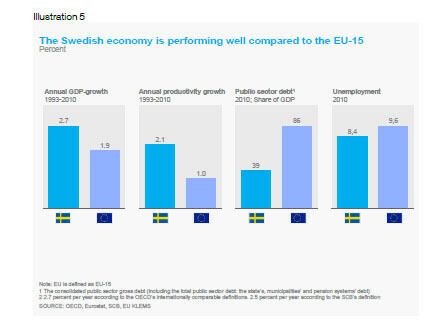 “The overall results show that the sector is actively engaged in the general tenets of Swedish working-life, characterized by co-operation, distributed responsibility and fair treatment,” the study said. Andersson and his colleagues concluded that the Swedish case suggests that the retail sector does not inevitably have to be one filled with impoverishing working conditions, nor do retailers have to adopt a “lean and mean” strategy to be competitive. The retail sector accounts for about 10 per cent of Sweden’s domestic GDP, and the latest forecast suggests retail sales growth of 2.6 per cent per year, compared with 1.3 per cent for all of Western Europe between 2014 to 2017. 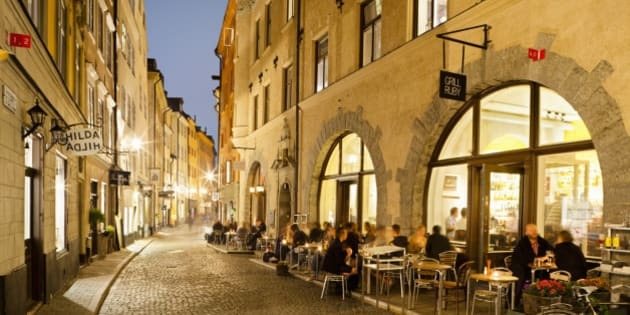 Sweden’s retail success isn’t easily exportable, as it is particular to a unique set of historical and cultural proclivities that has bred a society committed to social solidarity, Brock’s Coulter said. She added, however, that it offers inspiration for Canadian workers, who can learn both from their own history and other countries to determine what is possible and how it might work here. Many employers have moved to declare themselves proud “living wage employers” committed to paying enough to keep workers out of poverty, about $15 an hour. And there are major corporations that serve as role models for an alternative, such as Costco, where average hourly pay hovers about $20 an hour. A Harvard Business Review study comparing the Walmart model of aggressive control of employee benefits to Costco’s more generous model found the race to the bottom of labour costs doesn’t necessarily benefit the bottom line because Costco’s more stable and productive workforce more than offset higher upfront labour costs. Economics 101 dictates that increasing the price of something decreases demand for it and therefore hiking the minimum wage would result in higher unemployment. But an experiment in Seattle, where minimum wage is $15 an hour has actually found that the city’s unemployment rate fell from 6.3 to 5.2 per cent from January to December of last year. If there were more outcry among Canadians about the treatment of retail workers, Coulter believes, the sector would slowly start to shift in favour of better jobs. “Fairness is a very powerful motivator for people, so in sectors like retail, workers also have to decide that they deserve better,” she said.